heneghan peng architects and the Airbnb Environments Team have designed the newest offices of online hospitality service Airbnb, located in Dublin, Ireland. 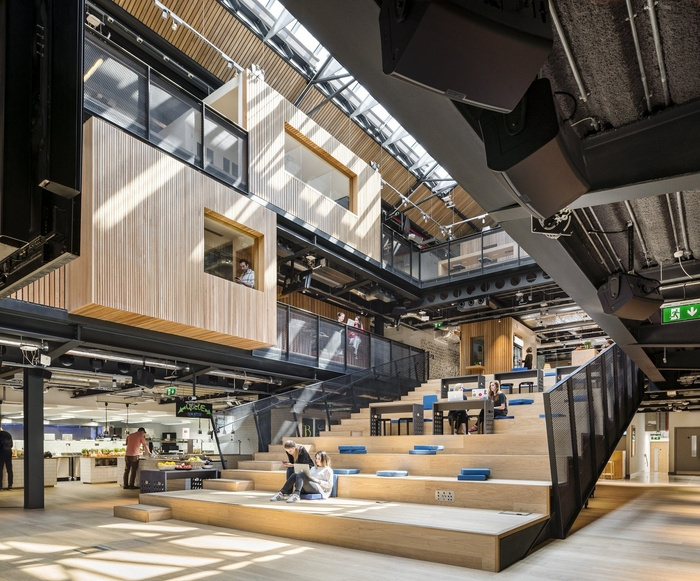 Airbnb is delighted to unveil its new International Headquarters in Dublin, The Warehouse, which has been designed in collaboration with Dublin-based heneghan peng architects. The new space has been designed to cultivate collaboration, interaction and a sense of community. This is the first time that Airbnb has been able to pre-determine the architectural layout of an interior space. The Warehouse had fallen into disrepair before Airbnb reinvented the entire space by designing distinctive structural elements including a dramatic cascading staircase. The Warehouse is also Airbnb’s first urban campus model which will become more prevalent in the brand’s offices going forward. Feedback from employees on the design of the Airbnb Portland office highlighted that employee visibility was challenging for management teams, due in part to the varied spaces in the office which are not all in the same line of sight. In response to this, the Airbnb Environments Team incorporated a ‘neighbourhood’ concept which still reflected Airbnb’s ‘Belong Anywhere’ ethos with a choice of work spaces and configurations, but allowed for teams to gather together in one dedicated base to encourage collaboration. The Warehouse is divided into primary and secondary work spaces. The primary work spaces consist of 29 neighbourhoods with identical components, for up to 14 people each. Every neighbourhood comprises of one large table, personal storage, one or two sit stands and one lounge spot. Individual desks have been replaced by one large central communal table which facilitates sharing in a way that individual desks cannot. The neighbourhoods also include custom-built furniture by local fabricators including tables by Burke Joinery. Secondary work spaces include the ‘Agora’, the kitchen area and the meeting rooms. The central staircase forms the main point of focus of the office. Coined the ‘Agora’, it connects the first floor to the basement, unifying the various floors. The staircase serves multiple purposes, from a large conference space and community event space for up to 400 people to a ‘lounge style’ working environment. The interior design of each meeting room is inspired by existing Airbnb listings around the world to enable employees to travel throughout their day. Design influences have been taken from Portugal, Greece, Romania, Japan, Sweden, Morocco and France. As part of Airbnb’s ongoing global office design strategy, The Environments Team engaged with local employees in an Employee Design Experience (EDX) programme to help add the finishing touches to the meeting rooms. This included a custom-built replica of a dining table from a Romanian listing and authentic decor from a listing in Montpellier, France. The EDX programme enabled employees to re-interpret design components from Airbnb listings into the meeting rooms as well as illustrate elements of Dublin’s local identity. The variety of work configurations within neighbourhoods and secondary works spaces encourages healthy ergonomic movement, increased socialising and engagement. The Environments Team, led by Aaron Taylor Harvey and Rachael Yu, worked in collaboration with heneghan peng architects to implement the neighbourhood concept and components into the space. Airbnb’s ethos supports local entrepreneurship and fosters relationships with local firms and businesses. This is highlighted in Airbnb’s choice to collaborate for a second time with Dublin-based architects heneghan peng, who partnered with Airbnb in 2014 to design the first Dublin office in the Watermarque Building. The Warehouse, the new 4,000 sqm office in Hanover Quay in Dublin, will house over 400 staff, covering a range of teams from customer service to legal departments. The previous office The Watermarque Building will continue to operate. The Warehouse was completed in April 2016.